I first made the cupcake, cookies and ice cream out of rice crispies. I molded them into shape and covered them with fondant. For the Ice cream I got a regular sugar cone, stuffed it with rice crispies, and put a rice crispies ball on top. I covered it with fondant. The bottom cake tier was made from humming bird cake which I then cut out a slice. The middle Tier was made from an 8 inch chocolate cake which I then cut in half, stacked on top of the other half and shaped it to look like a giant cake slice. I had to stick a rod inside it to prevent it from tilting. I covered both cakes with frosting and then fondant. I added all my fondant decorations to look like cake. I stacked the cake slice on top of the main cake and then I stacked the giant cupcake on top of the cake slice. I placed the other embellishments around the cake. I love the whole thing, the cheerful summer colours and the scene you've set! Not to mention that it looks utterly delicious! Five-stars from me, absolutely!!! This is a unique cake. I love every little piece of it, it looks much nicer and yummier that any I have ever seen. Very interesting and unique looking cake. I love the use of colour and the different looking desserts on there. Very well done. Your talent and creativity far surpass any that I have seen! Nobody do ut better !!! Can you please not poste those delicous pictures of your cakes? This one looks so yummy and I can only blame you when I forget my diet!!! 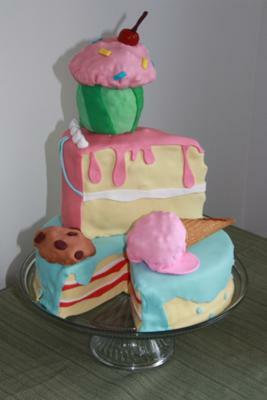 Wow Sara....this cake is amazing....I love the whimsicalness of the cake slice and the cupcake. All the colors are beautiful and the little ice cream and cookie decorations are awesome. A beautiful and amazing cake! This an amazing cake, so beautiful and unique. 5 stars for sure.